I read with interest the stories posted by my colleagues Kyle Field and James Ayreabout the plans Electrify America — a division of Volkswagen — has made to create a massive new EV charging network across the country. Adding 2,000 DC fast chargers in 17 US cities and along major transportation routes in 39 states is big news. ArsTechnicahas a few more details that may interest you. 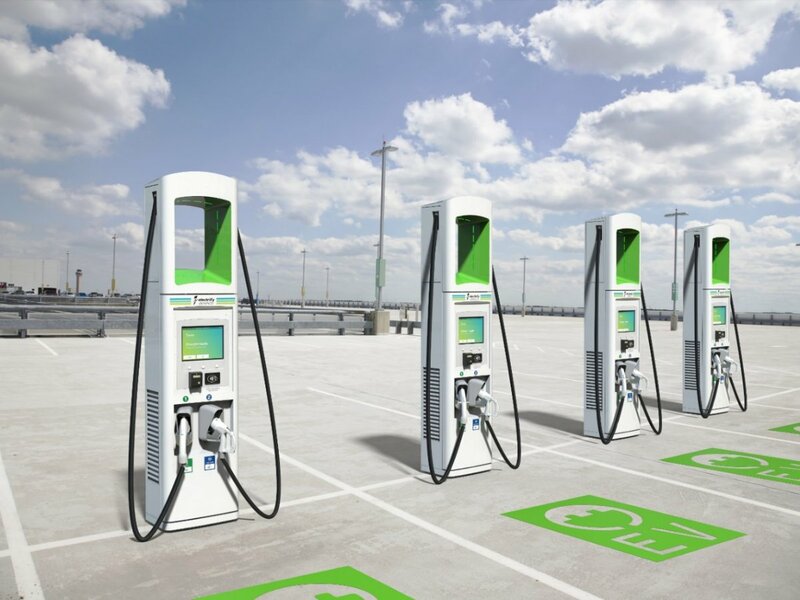 Since there are no universally accepted charging standards yet, the chargers found along highways will offer motorists a choice of CHAdeMO 50 kW connections or CCS1 connections that provide either 50, 150, or 350 kW of power, the latter by way of liquid-cooled charging cables. As ArsTechnica slyly points out, there are currently no cars sold in America that are capable of charging at 350 kW of power, but it just so happens that Porsche, Audi, and Volkswagen’s new ID division may be offering such cars by the time the chargers are available. Timing is everything, folks. Volkswagen is prohibited by the terms of its agreement with federal authorities from branding the charging network as a VW enterprise. But if the chargers and its cars happen to be a marriage made in heaven, who could possibly complain? In urban areas, the charging stations will also offer good old-fashioned Level 2 charging for cars like the Chevy Volt/Bolt cousins and the BMW i3, and some of those can at least take advantage of the 50 kW options. “By placing our ultra-fast charging systems in locations drivers enjoy stopping at, we help reduce charging anxiety and increase the public acceptance of electric vehicles. Dramatically increasing the charging speed by offering the first-ever certified cooled-cable 150/350kW DC Fast Chargers is also a significant step, meaning less time is spent refueling,” said Mark McNabb, president and CEO of Electrify America. While reading the ArsTechinca article, I came across a comment from someone who styles himself as tech010101x. He seemed to know what he was talking about and offered a lot of information I think people here will be interested in knowing, so I am sharing his comment in its entirety with you. And tech010101x, if you are out there and see this, thanks for a long but highly lucid explanation of what is going on behind the headlines. It is 2018 and even a technical audience like this one on Arstechnica still has quite a long ways to go in terms of learning about EVs. But there are also more people educated to help provide answers. First, I should note that SAE stalled Tesla when Tesla was developing the Model S’s DC fast charging capability. Tesla had no choice but to go with their own connector back in 2011. The eventual CCS standard that was passed still didn’t support the charge rates that Tesla needs. In Europe, Tesla uses the same Mennekes plug that CCS uses, but not the additional two lower pins for DCFC. That means for a physical perspective, it isn’t hard to accommodate CCS Type 2’s upcoming higher charge rate plug in the Model 3. The Model S and X would need a plug port redesign or the flap that Tesla did to support China’s GB/T standard. The industry really does need to sort out some labeling convention. The upcoming CCS standard uses a 350 amp current limit at 500 volts and 1000 volts. Hence 1000 volts x 350 amps = 350 kW. However, no one ships 1000 volt battery packs. The upcoming Porsche Mission E is touted to have an 800 volt battery pack. That already limits the charging to 800*350= 280 kW. But in reality, the maximum current can usually only happen, at best, at 90% pack voltage. So that’s really 250 kW. Porsche actually talks about 220 kW charging off a 350 kW EVSE. The 150 kW label is very strange. Most packs shipping today are 400 volt packs and the upcoming Jaguar I-Pace has a 450 volt pack. For the Jaguar, we don’t yet know the maximum charge rate, but just based on voltage alone, it is 140 kW. The chemistry and life cycle concerns may lower that significantly. On normal packs, the top end speed is 130 kW. Again, each EV’s battery chemistry and charging system will introduce lower limits. Using the same labeling style, Tesla could claim that their existing Superchargers are 185 kW (500 volts x 370 amps). Right now, about 350,000 Tesla vehicle’s can DCFC at SAE Level 3 rates. That’s greater than 200 amps. Today, the number of non-Tesla vehicles released for sale with L3 DCFC is 0. Even at the end of 2019, Tesla will likely have a market share exceeding 90% of Level 3 capable vehicles on the road. By end of 2020, Tesla may have well over 1 million L3 capable DCFC vehicles on the road. Everyone else combined might be around 150,000 to 250,000. The really serious BEV build plans don’t really kick in for other automakers until after 2020. As a result, the market share on the ground for L3 DCFC in Europe and North America will be heavily Tesla. Then we have the problem that CCS supports level 2 charging with the level 3 system. Which means slow DCFC vehicles like the ‘17 and ‘18 Chevy Bolt and the upcoming Kia Niro as well as older models like the BMW i3 will clog up Level 3 DCFC plugs, holding them for much longer because they take so long to charge to get adequate range. VW/Porsche hinted that they will charge large fees at their 320/350 kW plugs, which may help deter slower charging vehicles from using them. The commenter is correct. There are a lot of people who do not understand the technical aspects of electric cars and their use. The sooner the industry adopts common charging standards and nomenclature, the faster the EV revolution will proceed.